We are all about how things are made. 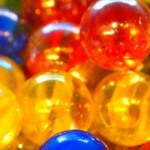 We’ve seen socks, beer, teddy bears and now… marbles. On our way through Kansas, we made a pit stop at Moon Marble Company for a live demonstration. We had some trouble parking our RV, but found an abandoned space across the street and ventured over to the store. We walked in and nearly drown in a sea of children. The front section of the store is filled with inexpensive machine-made marbles, and was absolutely packed with kids! We waded to the back which had calmer waters and filled with every imaginable kid’s game, toy or puzzle. Parents beware – if you bring your kids, make sure you bring the credit card – you will be spending money. In a door off to the right of the glass case is the demonstration room. We could see the owner, Bruce Breslow in the middle of making a marble for a pretty large crowd. A gentleman told us he was almost done and that they would make an announcement for the next demonstration. So we killed some time in the store, and finally decided to just join the demonstration… already in progress. In a few moments, Bruce finished the last touches before putting it in the oven to cure. So, we just stuck around for the next full demonstration, which started in only a few moments. This round, Bruce decided to make what is called a “paper-weight” marble; a bit larger than a standard marble but absolutely beautiful with intricate glass designs in the middle. The one he would create today featured a Christmas tree and other holiday pieces. Right up my alley! The process is surprisingly simple, of course when it’s presented by an expert. He first takes his time to create one side of the marble using clear glass rods, then adds the designs and adds the bottom of the flat edge. He then covers the newly added design elements with more melted glass and highlights the second half with a magnetic blue which adds a wonderful bright finish to the piece. We would have loved to purchase this marble because we witnessed its creation. But after he spins the glass it takes about twelve hours in an oven to cook. So, we had to browse the display case when he finished. The art of marble making, and even glass sculpting, is not as common as it once was, and it’s important to support artists who work hard in these fields. With that said, be sure to check out their website and if you’re ever passing through Kansas, take the time to watch a demonstration and support their art with a purchase or two. Plus, marbles are fun! Click here for Moon Marble’s official website.